MD Anderson and the Dynamo plan cancer prevention education, community outreach, survivorship celebrations, public service announcements and philanthropic initiatives through the multi-year agreement. HOUSTON ― The University of Texas MD Anderson Cancer Center and the Houston Dynamo announced Wednesday plans to work together toward one goal: end cancer. Effective Jan. 1, MD Anderson is the official cancer center and jersey partner of the two-time Major League Soccer champion. The collaboration marks the first season-long cause-related jersey partnership in MLS history. 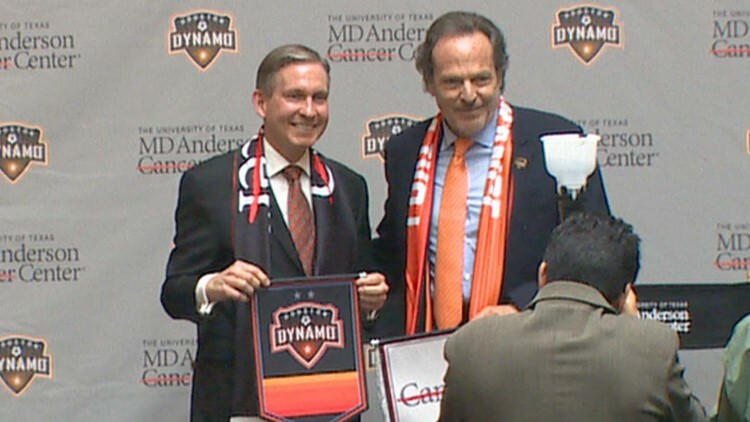 "We are honored to join forces with the Houston Dynamo in an effort to beat this terrible disease," said Peter WT Pisters, M.D., president of MD Anderson. "This unique collaboration will provide a platform for educating millions of fans on how they can reduce their own cancer risk and actively engage in our collective efforts toward Making Cancer History." Dynamo also unveiled their 2019 away jerseys bearing MD Anderson's strike-through-cancer logo. Pisters and Dynamo owner Gabriel Brener led the jersey reveal with team mascot Diesel in a ceremonial "Starting XI" photo with pediatric and adult cancer survivors. The co-branded jersey symbolizes the two organizations' mutual commitment to encouraging fans, club partners and the Houston community to join the team effort in Making Cancer History. In addition to jersey branding, the partnership agreement enables MD Anderson to reach a broad, diverse and international audience through joint community events with the Dynamo, stadium signage and public service announcements. The Dynamo will engage player ambassadors in cancer prevention education initiatives and will create fundraising opportunities such as contributing a portion of the club’s ticket sales to support MD Anderson's mission to end cancer. In conjunction with Wednesday’s partnership announcement, the Dynamo also announced that BBVA Compass Stadium will become a tobacco- and smoke-free facility as of Jan. 1, 2019. Smoking and tobacco already were prohibited inside the seating bowl and concourse, and Wednesday’s announcement extends the policy throughout the property. BBVA Compass Stadium will join many other stadiums, arenas and venues around the country in offering a fully tobacco- and smoke-free environment to all of its guests. In addition, plans are in development for healthy concession menu options to be available for the 2019 season. The Dynamo also committed to donating a portion of single-game ticket sales to MD Anderson along with offering fans the option to add on a donation of their own during the purchase process. "Today is the start of something great, and we applaud the Houston Dynamo for making a bold commitment to the health of its fans, players and staff by creating a tobacco- and smoke-free environment for all to enjoy," said Pisters. "We are proud to align with this forward-thinking organization as we work together to promote cancer prevention and to advance innovative cancer research and patient programs." Joining Pisters and Brener at the launch event were Dynamo minority owners Oscar De La Hoya, Jake Silverstein and Ben A. Guill, who is a member of the MD Anderson Cancer Center Board of Visitors. John Walker, president of business operations for the Dynamo and Dash, players Chris Seitz and Memo Rodriguez and team mascot Diesel also were on hand. Dynamo fans and MD Anderson supporters enjoyed the festive celebration emceed by Sarah Pepper of Mix 96.5, complete with a DJ and music by El Batallon, face painting, photo stations, an inflatable soccer activity, a display of Dynamo trophies and giveaways including a commemorative scarf featuring MD Anderson's strike-through-cancer logo and the Dynamo's #ForeverOrange slogan.